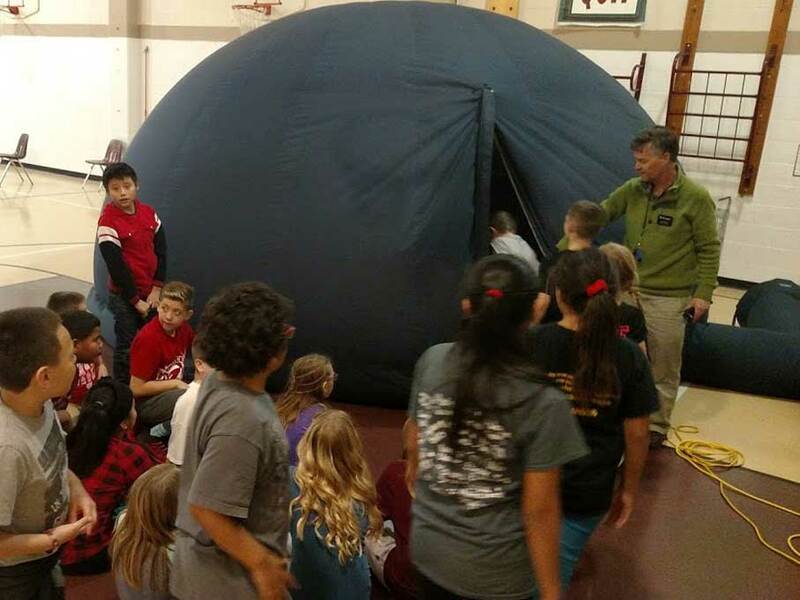 The Edgerton Explorit Center has purchased and received a portable planetarium to add to its extensive offering of Edgerton on the Move (EOTM) programs and field trip offerings. The planetarium will be capable not only of showing the daytime and nighttime sky but also prerecorded full dome planetarium shows. The planetarium was purchased using funds granted by several generous donors, including B.K. and Norma Heuermann Foundation Fund, Heuermann Family Trust Fund, the Get R Done Foundation, Woodard Trust, Southern Power, Hamilton Telecommunications and an anonymous donor. The planetarium, made by Digitalis Education Solutions, Inc. of Bremerton, WA, uses Nightshade, a version of the popular freeware astronomy Stellarium (stellarium.org) to depict the sky. From a computer, images are projected using a video system equipped with a fish-eye lens. With a diameter of five meters, the inflatable dome will have enough room to seat a class of 25 students. Visitors enter the dome walking in, and the dome is wheelchair accessible. The entire system can be set up in 30 minutes. The planetarium will be part of a series of educational activities and events centered around the August 21, 2017 total solar eclipse, the path of which crosses Nebraska. The Edgerton Center is working with Hall County Convention and Visitors Bureau, Aurora Area Chamber and Development Corporation, NASA Nebraska Space Grant and other organizations to promote viewing this extremely rare event from central and eastern Nebraska. The planetarium made its public debut during its Preclipse event held August 21, 2016 (exactly one year before the eclipse). Visitors were invited to see the planetarium, view the Sun with special telescopes and participate in other Sun-related activities. 30 minute interactive tour of the night sky with Dan Glomski, longtime astronomer in new portable planetarium. Great way to educate students about upcoming total solar eclipse taking place on August 21st, 2017. $350 for half day, up to 4 thirty minute shows done every 45 minutes. Ask about full dome videos to enhance your experience.